Do Not Consider Yourself Free was the official newsletter of the New York City Animal Defense League chapter. Contributors included many prominent 90s activists, such as Sarahjane Blum, Patrick Kwan, Kim Berardi, Ryan Shapiro, Lance Morosini, Brian Smith, Melanie Bartlett, Darius Fulmer, Justin Taylor, Christine Matyasovsky, and Lauren Gazzola. 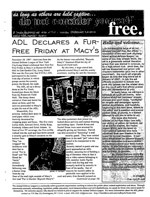 The publication primarily covered the ADL’s spectacularly planned acts of civil disobedience against the fur trade and many arrests of its members, but also included interviews and original articles. 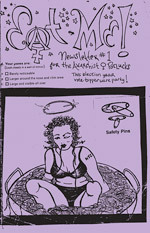 It remains one of the most well known and fondly remembered newsletters of its era. Conflict Gypsy is proud to present the complete set here along with this new introduction by Ryan Shapiro. “The late 1990s was a different world, and the NYC Animal Defense League rocked that world. Working closely with the Long Island, New Jersey, Connecticut, and Syracuse chapters of the ADL, as well as with the NYU animal rights organization SEAL, the NYC-based Wetlands Animal Rights Action Team, and DC-based Compassion Over Killing, NYC ADL warred against animal exploitation and abuse in New York City. 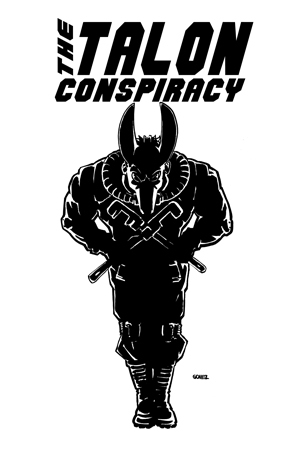 NYC ADL sought to combine the aggressive militancy that characterized the grassroots animal rights movement of the late 1990s with a parallel focus on strategic and tactical planning. Our goal was to be both radical and smart. Efficacy was our watchword. As such, NYC ADL members could be found in camos while recruiting at Earth Crisis shows and in suits and dresses while occupying the President’s office at NYU (even if we still had Firestorm playing on the President’s stereo). We placed particular emphasis on our civil disobedience actions. 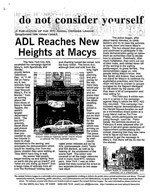 In the heady days before 9-11 and the Animal Enterprise Terrorism Act, NYC ADL organized seemingly ceaseless opportunities to challenge animal exploitation by locking ourselves to things. 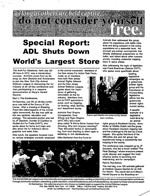 Through boldness of vision, obsessive attention to detail, and the courage of our membership, NYC ADL sought to perfect the art of the urban blockade. Whether it was learning the science of concrete solidification or busting out the algebra to determine the optimal participant distribution for a lockdown, NYC ADL devoted ourselves to coordinating spectacular acts of civil disobedience that served as models for other groups around the country. Among our proudest accomplishments was to repeatedly shut down the world’s largest store, Macy’s Herald Square, in protest of Macy’s continued sale of fur. Before the term snacktivist became derogatory, several amazing publications such as Soy Not Oi and Raggedy Anarchy promoted veganism and protest alongside recipes for tasty food. One much more obscure publication, EAT ME, was written by best selling vegan cookbook author Isa Moskowitz. Although the content doesn’t match the focus of most of our site, there is certainly a fun archival nerd collector value to seeing one of the most prominent faces of veganism during her radical youth. And yes, each issue contains a recipe. 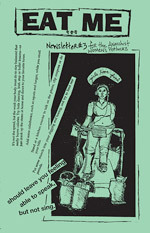 We are happy to have a new introduction to these newsletters from Isa herself.